Everyone’s having a great time at the Farm holiday club this summer! 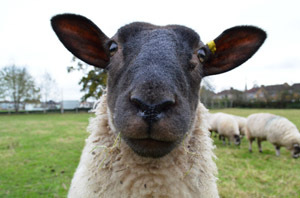 We’ve made scarecrows, cobwebs, mosaics, bug hotels and, of course, taken good care of the animals and flowers. Lewis Perry has cerebal palsy and learning disabilities. 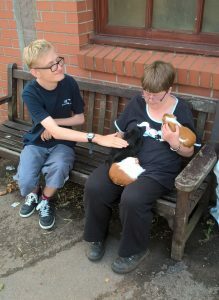 When Lewis first came to our holiday club he didn’t have much confidence and didn’t want his mum to leave. Since Lewis joined us he’s got involved in fun, varied, and engaging activities. He’s helped blend our tomato and courgette soup (made with ingredients grown at the Farm), smashed up tiles for our mosaic, collected chicken eggs, made farm-inspired collages, and created a bug hotel. Through trying a bit of everything we’ve found what Lewis is really interested in; woodwork and chicken care. Lewis’ confidence has completely changed and he’s often heard saying: “I love the Farm, Farm good!”. Lewis’ mum is delighted with the holiday club: “Lewis, a child who needs structure, would be sat inside playing on his iPad but the holiday club has given him the opportunity to be outside trying new things”. Why come to holiday club? 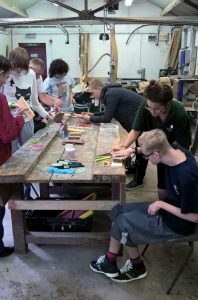 The team at Elm Tree Farm noticed there was a gap in provision of summer activities for kids with support needs. Parents would often tell us that they had problems arranging time off work, and that youngsters were losing links with friends and getting frustrated being at home all day. The aim of our holiday club is to try and fill this gap so we’re really pleased to have such good feedback from Lewis and his mum. Our holiday club benefits all of our youngsters whether it’s having fun making bird nests, learning about where food comes from, or getting some unique farm experience as we walk the ponies. For more information about our holiday club, please email etf.holiday.club@brandontrust.org or call Gaby on 07464 670 915.